in many communities, because destinations are too far or too dangerous to reach by foot or bicycle. These trips add millions of cars to our roads every year. decentralized, therefore increasing independence on the automobile. 1.5 million senior citizens (U.S. Census 2008 population) and this number is growing quickly. Many of these senior citizens, along with other New Jersey residents who do not have access to a vehicle, live in suburban communities. These same suburban communities do not accommodate people on bikes or foot. NJFIT is working to ensure these residents enjoy basic mobility by providing transportation options. 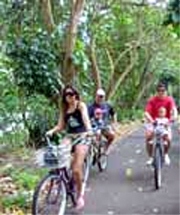 Biking provides a healthy way to get around. 20 to 25 percent less than households in conventional, low-density, auto-oriented suburbs. More Ways to Travel FITness goal is listed below in the drop down boxes. Achieving this goal is possible through the application of various tools and programs.